There may never have been a craze as stupid -- or as profitable -- as the Pet Rock. The Mexican beach stones cost a penny a piece in the 1970s. They were packaged in a cardboard box (with air holes cut out), placed in a straw nest, and sold for $3.95. 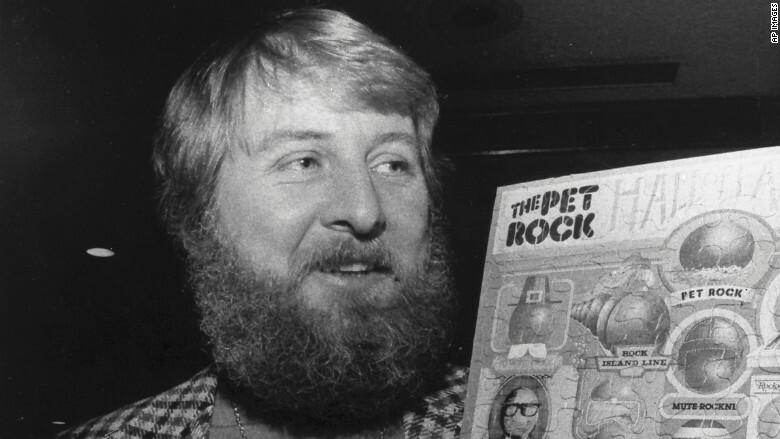 Gary Dahl, the Pet Rock's inventor, became an overnight millionaire. He told People magazine in 1975 that he was selling 100,000 Pet Rocks a day, making 95 cents profit on each rock he sold. And, remember, that was before Amazon. Dahl died last week at age 78, according to the New York Times. 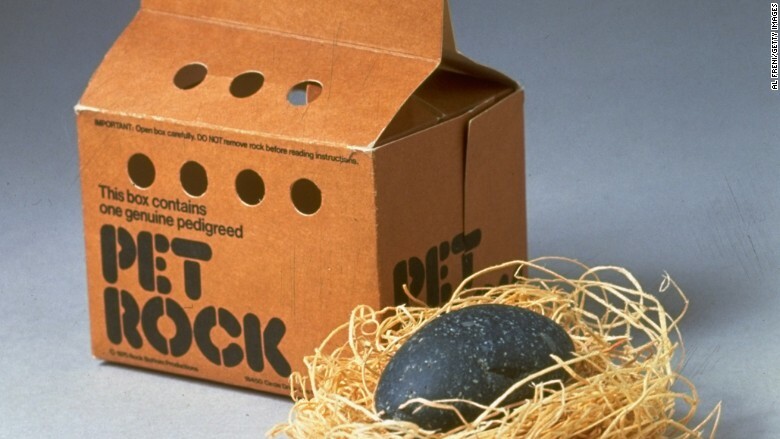 An instant success, the Pet Rock debuted in time for the holiday shopping season 1975. Dahl, who at the time was an advertising copywriter living in Los Gatos, California, told People that he came up with the idea while drinking at a bar with his friends. Dahl said the biggest expense was manufacturing the carrying boxes, including the die-cutting for the air holes. How could such a crazy idea become such a successful business? Dahl said the Pet Rock was timed perfectly. "At the time, the Vietnam War was winding down; Watergate has just started up," Dahl told the Toledo Blade in 1999. "There was a whole lot of bad news going on. People were down. It wasn't a real good time for the national psyche. I think the Pet Rock was just a good giggle. Everybody needed a good laugh and the media ate it up." Perhaps the most brilliant part of the Pet Rock package was the accompanying 20-page manual, entitled "The Care and Training of Your Pet Rock." "If, when you remove the rock from its box, it appears to be excited, place it on some old newspapers," the manual began. "The rock will know what the paper is for." The manual also taught Pet Rock owners commands for "simple obedience" and "amusing tricks." Dahl became a quasi-celebrity, appearing twice on the Tonight Show starring Johnny Carson. He received endless calls from inventors who were trying to mimic the success of the Pet Rock. "They're all bad," he said of the inventions. 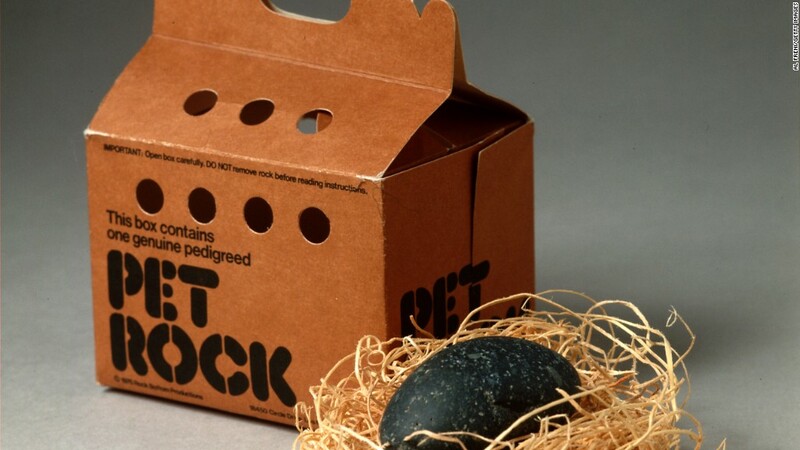 A company called Rosebud Entertainment now holds the Pet Rock trademark and operates petrock.com. The company brought the Pet Rock back to store shelves in 2012, and you can buy one online ... for $19.95.